Now I’d quickly like to discuss the playing field considering I have recently posted a general introduction to the sport. Without understanding the components of a cricket field, it is highly unlikely that you will be able to implement tactics and strategies that will outsmart your opponent. You must have a clear understanding of the key field placements and how you can use the field to your advantage. In general, a cricket playing field does not have any specific dimensions. Some fields can be a perfect circle and some can be slightly elongated. The dimensions vary from location to location but the basic elements remain consistent. Before we move on to the content, I’d just like to say that I am quite happy with the way my initial graphics turned out, and will be using them in future posts to demonstrate specific strategies or ideas. I’ve also thought about releasing the PSD itself so that you guys can use them to make note of your own performances. I’ll definitely do this in future if there is enough demand. Hope you guys like it. The above image shows a standard cricket field with a few key components. The first thing I should mention is that this pitch is currently outlined for a right handed batsman. The field is always divided up into two basic sections, the On Side and the Off Side. 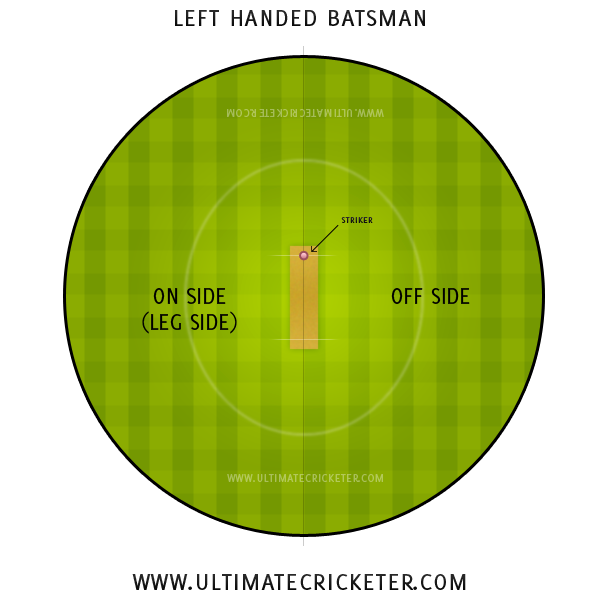 Depending on the stance of the batsman (left handed/right handed), the two sides of the field alternate. For a right handed batsman, the on side and off side are as shown above. For a left handed batsman, the two are reversed. You will understand this concept even further as you read through the article. Furthermore, as you can probably see, there is a 30-yard circle and then the boundary. 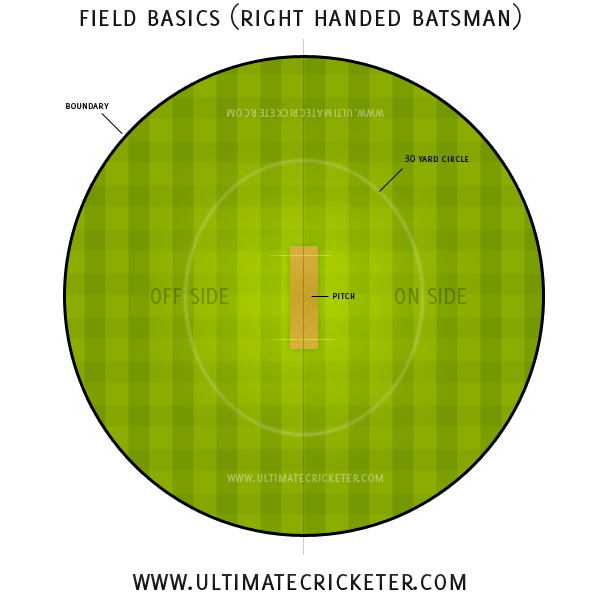 Anywhere from the pitch to the edge of the 30-yard circle is known as the ‘infield’ and the from the edge of the 30-yard circle to the boundary is known as the ‘outfield’. The reason for these two divisions are basic fielding restrictions. The type of restrictions that apply depend on the format of the game that is being played. Again this is something that I will discuss in a future post. The boundary defines the limit of the playing field. Finally, the pitch is located in the center of the field (usually). This is probably where the most variation takes place. The pitch conditions can dictate the flow of the match and determine who has the upper hand. There is a whole process involved in the preparation and maintenance of the pitch which ultimately results in how it plays. This again varies depending on location and depending on the ground staff who prepare the pitch before a game. As mentioned above, the field is usually divided up into separate sections known as the on side and the off side. 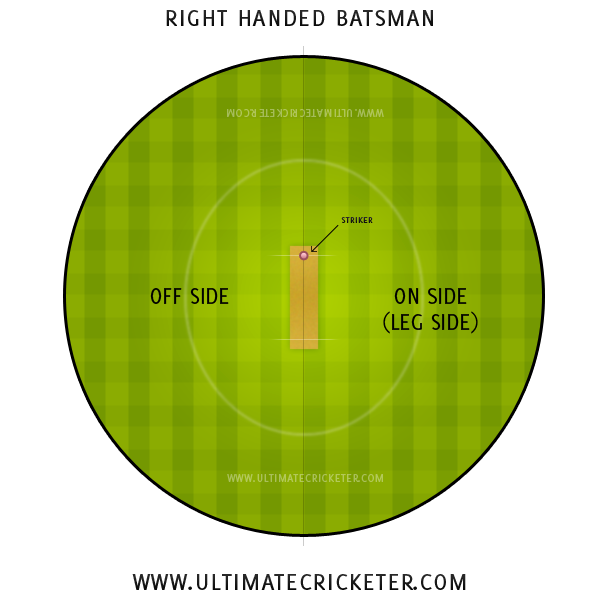 As you can see, the location of the on side/off side is dependant on the stance of the batsman. The pink dots indicate the fielding positions available for the remaining nine fielders. As you can see, there are many possible locations to place fielders that will allow the team to try to influence the way the opposition plays. I’d like to break each individual fielding position down into further detail however that will be done in a future series of posts. Trying to both display and understand each position within one image would become very chaotic. 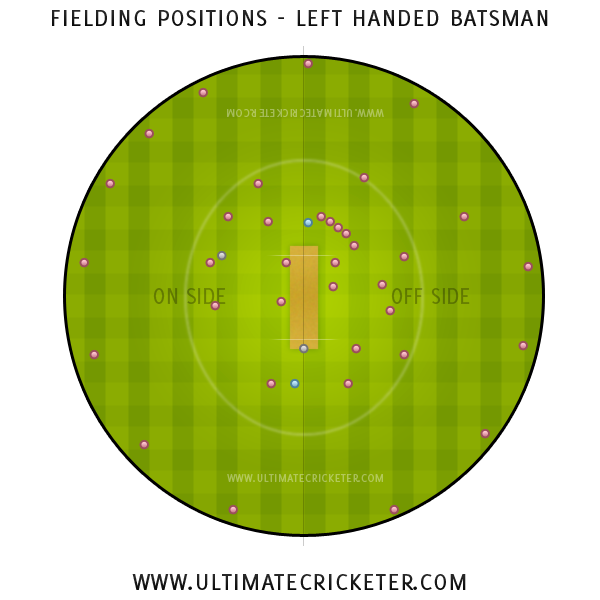 I thought it would make sense to also post a similar graphic for a left handed batsman. Nothing has changed specifically, the locations have simply been reversed. As you can see, there is a lot of freedom within the game and any team can decide on a strategy that suits their playing style and the match situation. This is a very basic introduction to the playing field and the possible fielding positions that can be used by the fielding team. At the end of the day the idea is to be able to manipulate these positions in a way that restricts the flow of runs for the batting team whilst also increasing the probabilities of taking a wicket. As you can probably tell, there is a lot of strategy involved in the game and it does not simply depend on luck or skill. By now, you should have an understanding of the basic layout of a cricket field and be able to identify positions at the disposal of the fielding team. Understanding and using the field will give you the best chance to turn the game in your favour.